The spring season gets a lot of people stoked for better weather and blooming flowers. However, some of us dread the annual general cleaning that the turn of the season requires. If you are like us who prefer to get the cleaning done instead of putting the task aside, then you should take a look at the tips we’ve prepared below. Spring cleaning does not necessarily have to be complicated as long as you follow some hacks that will speed up the process. Cleaning each slat of your window blinds will get dirt and dust everywhere. So, it would be better to take down the blinds and soak them in a vinegar and water solution. Once you see that the dirt and dust have dissolved into the solution, give your blinds a good rinse and then leave them under the sun to dry. Mount them back onto your window and you now have clean blinds without the fuss! Cleaning your ceilings and walls can be a complicated and huge task to undertake. The best way to do this is by working on your ceiling first. Clean your ceilings first by using a vacuum with a brush attachment. Make sure you use lint-free cleaning cloths when drying the walls to avoid streaking. It would also be easier if you use mops with telescopic handles so you can easily reach your ceilings. Also, remember to wipe your light switches and outlet covers clean. If you have a ceiling fan, you might need to remove the dust that has collected over the winter. However, cleaning a ceiling fan can be tricky as the dust can escape and fall on your couches or beds. So, make sure that you cover your fabric surfaces with pillowcases or thin blankets before you clean your ceiling fan. Once you’re done, you can simply toss your pillowcases and blankets in your washer. The common way to clean your outdoor space is by sweeping away the webs, leaves and winter stains. You can also scrub your pavement to make sure that it’s clean. However, you can save time and effort by using a power washer. You wouldn’t have to break a sweat when using this piece of equipment. If you do not have one, borrow from a friend. You can also find home improvement shops that offer pressure washers for rent. It can be quite difficult to remove calcified grim and grease off your burners. This might even be the hardest thing to clean in your home. On the other hand, there is an easier way to make your burners sparkling clean again. All you have to do is seal every burner in a plastic bag with ammonia. Leave them overnight and when you wake up in the morning, the grime would come off. All you need to do now is wipe your burners and they will look sparkling clean again. When you use a feather duster, you are only pushing the dust around instead of catching it. It would be better if you use microfiber cloths when cleaning off dust as they are more efficient. You can also lightly mist the area you’re cleaning before wiping it with a microfiber cloth to get the best results. You have to deal with a lot of things inside the kitchen so you should find ways to lessen the load. You can eliminate the need to scrub your microwave by following our simple method. The best thing about this tip is that all the items you need can be found in your pantry. It’s so easy that you would only need about 15 minutes and virtually zero effort to complete the task. 1. Mix equal parts vinegar and water together in a bowl. 2. Place the bowl with the solution inside your microwave and heat it for five minutes. 3. Let the solution sit inside the microwave for an additional five to ten minutes and let the vapours work their cleaning magic. 4. Dip a clean cloth into the solution and use it to wipe down the microwave. It’s perfectly normal to have a pickle-smelling kitchen while you’re doing this process. However, once the vinegar dries, the smell will dissipate. As you progress with your spring cleaning activities, you will find that you’ve collected a lot of waste and clutter from your home. You can opt to get rid of them with the help of your local garbage collector. However, you wouldn’t be able to do so in one go, especially when the amount of waste you’re getting rid of does not fit inside your wheelie bins. So, if you are planning to do some major spring cleaning activities, it would be best to hire a skip bin. Most skip bin hire companies allow their clients to keep the skip on their property for four to seven days. In this way, you will have enough time to gather your waste inside the bin. Skip bins also come in different sizes so you can get rid of your entire rubbish load in one go. The skip bin company will pick up your waste on your scheduled date for your convenience. While we have our own ways to make spring cleaning easier, there are also some mistakes we commit that make the process tedious and time-consuming. Make sure you avoid the following mistakes when dealing with household dirt and grime. If you do not clean your mops, cloths or vacuum cleaner bags, you are only making your space dirtier. You won’t get the right results and would only be working even harder. So, make sure you clean or replace your cleaning tools when necessary. The dirt you bring inside your house can build up over time. So, it would be better if everyone who enters your home will remove their shoes at the door. If guests feel uncomfortable going shoeless indoors, then have pairs of slippers ready for them by your door. The warm sun can easily dry your cleaning solution even before you wipe it away. This will leave unsightly streaks that would require you to start over. So, it would be best to clean your windows on a cloudy day. Grime and stains can be removed more easily when you let the cleaning solution sit for a few minutes. With the dirt softening, you would not have to scrub the surface too much. Doing so saves you energy and scrubbing effort. We all know how complicated and difficult spring cleaning is. However, by following the aforementioned hacks and avoiding the mistakes above, you can make the process faster and easier. 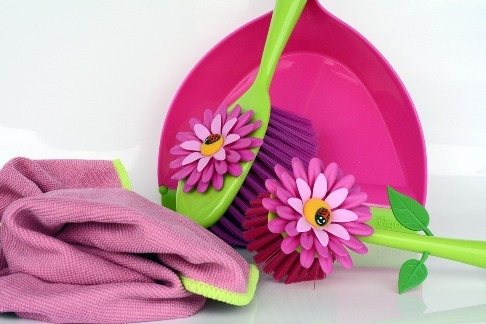 Read this also : Frugal spring cleaning checklist.